This entry was posted in Art, Travel and tagged Michelangelo, Pope Julius II, Sistine Chapel. Bookmark the permalink. I visited the Sistine Chapel for the first time last summer. It was a record day in Vatican City: hottest day of the year and a record number of visitors. We were rushed through the church and once we got the chapel it was far too hot and stuffy, with hundreds of guests talking and taking photos. The guards couldn’t do anything but their classic SHH! It was beautiful, of course, but miserable due to circumstances of that day. There is also that awkward metal fence dividing the chapel giving it more of sweaty prison feel rather than a Holy place. Still, one of the greatest works of art in the world. 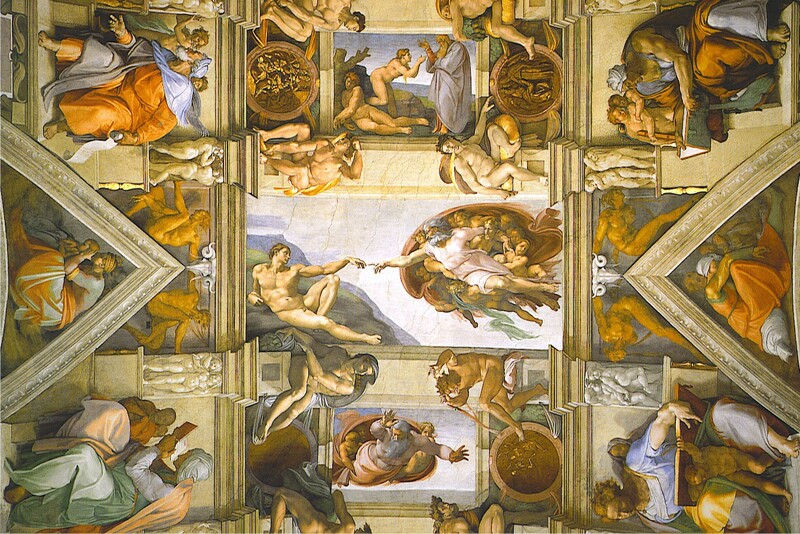 There are days — and you must have been there on one of them — when the Sistine Chapel has many thousands of visitors. Under those circumstances, you’re right that it is far from a religious experience. As you also acknowledged, one can’t help but be awed by the artistic achievement it represents. Thanks for your comment, Chris. Postscript: At the end of 2012 Antonio Paolucci, the director of the Vatican museums, announced that new measures will be implemented to reduce pollution damage to the Sistine Chapel caused by tourists. Layers of grime have been accumulating from the heat and dirt that the thousands of daily visitors generate. No plan was announced for reducing noise pollution, so presumably the low-tech “Shhhh!” of the guards will continue to be used.